President’s Day celebrates the birthdays of George Washington and Abraham Lincoln (though there is some confusion about the day itself). You can find additional resources at The Best Sites To Learn About U.S. Presidents. Presidents Day has an issue is from The Washington Post. Happy Birthday, Mr. President is a simple “talking book” that also describes how President’s Day began. Brainpop movie about Washington is good, but you need a paid subscription to view it. Or, you can sign-up for a free trial. Though description of Washington’s ownership of slaves is not accessible to English Language Learners, teacher’s could certainly modify it. George Washington, Slave Catcher is from The New York Times. EL Civics has a very good presentation on George Washington. The History Channel has many online resources on Washington. Though the language in story is a bit “old-fashioned” it’s of course important for students to know the popular myth of George Washington and the cherry tree. Enchanted Learning has a number of accessible materials about Washington. Here’s an online cloze (fill-in-the-gap) about both Washington and Lincoln. Take a short quiz on President’s Day. Here’s an older post in the NYC Public School Parents blog titled Lessons For Michael Bloomberg On President’s Day that provides an excellent summary of George Washington’s leadership style. The post’s writer, David Bloomfield, then contrasts that with how Mayor Bloomberg acts in school matters. The Mayor doesn’t come across favorably. But whether or not you know much about what’s going on in New York City, or even if you support Bloomberg, the summary of Washington’s leadership style is grist for an engaging lesson and student discussion. And, because of that, I’m adding the post to list. The Mount Vernon site has lots of resources (some non-flattering but true information may be omitted), but I’m still adding it to this list. The History Channel’s site on Lincoln is not-to-be-missed. Beacon Learning Center has a simple “talking story” about Lincoln. Abraham Lincoln For ESL Students is from EL Civics. The Constitution Center has an online game, with audio, about the decisions Lincoln made as president. It’s called Abraham Lincoln’s Crossroads. Lincoln’s Gettysburg address is the focus of these ESL exercises. The Mask of Lincoln is a new Smithsonian exhibition. Enchanted Learning has Lincoln resources. Brainpop,Jr. has its own Lincoln movie (again, you have to subscribe or get a free trial). The Smithsonian has a neat presentation of the Gettysburg address which includes a “zooming” capability, along with providing audio support for the text. 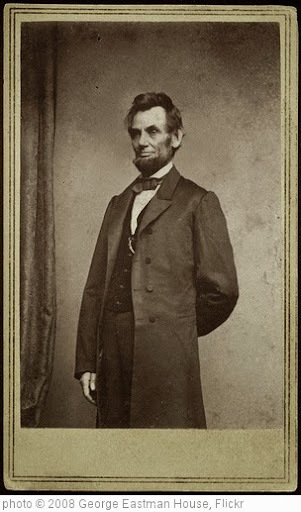 Portraits of Abraham Lincoln is a slideshow from TIME Magazine. I’m adding a New York Times slideshow on Ford’s Theater (where Lincoln was shot) to list. Birthday Party For An American Icon is a slideshow from The Washington Post covering how Lincoln’s 200th birthday was celebrated. The National Parks Service has put together a really exceptional interactive on the Lincoln Memorial in Washington, D.C.
Why We Love Politics is by David Brooks. What Would Lincoln Do? — looks at various challenges facing the U.S. after his death (including whether or not to use the first nuclear bomb) and considers…what would he have done? Team of Rivals — read about each of his cabinet members and guess which one he would place in which position. Who’s Who Of Congress — Learn about individual Congressmen and guess which ones would support the 13th Amendment. Rethinkin’ Lincoln on the 150th Birthday of the Emancipation Proclamation is by Bill Bigelow. If you’re ever in a position where you need to teach about Lincoln’s assassination, the new Lincoln Killing interactive from National Geographic is going to be one of your “go to” resources. Presidents’ Day: A Life Lesson for Students is from Edutopia. Why Presidents Day is Slightly Strange is from The Washington Post. Presidents’ Day Activities is from The National Education Association. Missing From Presidents’ Day: The People They Enslaved is from GOOD. Time to Tell the Truth About Slavery at Mount Vernon is from The Zinn Education Project. Death Of A President is a Smithsonian interactive. Memories of Abraham Lincoln is a photo gallery from The Boston Globe. Historic Photos of the Lincoln Memorial is from The Atlantic. A Lively History Activity for Presidents’ Day is from Middleweb. Three Teaching Ideas for Making Presidents’ Day Great Again is from The New York Times Learning Network. If you found post useful, you might want to check out my other “The Best…” lists. In addition, you can also subscribe to blog for free. PreviousKnow Of Research Showing Technology’s Effect on English-Language Learning? This is exactly what I was looking for! Thanks so much for your post! Here is a great word list I found on Vocabulary and Spelling City using President’s Day words. http://www.spellingcity.com/view-spelling-list.html?listId=874274 Kids love the free, fun games on this site. They don’t realize they are learning! Just an FYI, but there is no such federal holiday as Presidents Day, with or without the apostrophe. The actual name of the national holiday is Washington’s Birthday and it is only about George Washington, not Lincoln or anyone else for that matter. Some state may have a Presidents Day holiday, but many do not.